← The Scottish Awards for Quality in Planning: Update and vote for the people’s choice – closing soon! The UK Cultural Protection Fund announced that funding has been provided to a project in the Garmain region of Iraqi Kurdistan, aiming to document and monitor the sites and run educational projects which help to upskill local archaeologists and develop education packs for schools relating to the importance of the Mesopotamian remains. This is one of nine major overseas projects that will benefit from the Cultural Protection Fund which exists to safeguard heritage of international importance threatened by conflict in countries across the Middle East and North Africa. The Garmian region was part of the front line during the Iran-Iraq War, suffered damage under Saddam Hussein’s repression of the Kurds in the 1990s and is only kilometres away from ISIS’ 2014 front line. 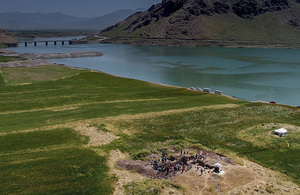 The recent conflicts have led to the damage and destruction of sites containing key information and artefacts from ancient Mesopotamia’s civilisations. Michael Ellis, UK Minister for Heritage, said: These sites tell the story of human history and show how our early ancestors first farmed and cultivated food. Their protection is therefore not only important to Kurdistan, but to all of humankind. This project is just one example of how our Cultural Protection Fund is providing essential support to countries where internationally important heritage has been damaged or threatened by war, conflict and terrorism. Tragically we have seen some of the world’s greatest cultural treasures destroyed in recent years. It is important, and right, that we share our expertise and support communities around the world to help preserve art, culture and heritage of global significance. Stephen Stenning, Head, Arts and Society at British Council, said: Important cultural heritage – from archives of music to ancient archaeological sites – is at risk of significant degradation or simply being lost forever. British Council’s work managing the Cultural Protection Fund provides vital support to organisations on the ground working to protect and preserve heritage. This latest round of funding for innovative and ambitious projects, extends valuable and ongoing conservation work, training, and education. By employing local people, developing skills and building capacity, this work also benefits the local economy.